This is the most important policy we have. Please obey the law, use common sense and help us keep Airsoft fun and great for the entire Airsoft Nation! Play safe, play responsible and play respectable. Eye protections must be worn at ALL time by shooter and all surrounding personnel when operating an Airsoft gun. Brandishing and Airsoft gun in public is illegal. Airsoft guns should never be taken out to the public or school. Prior to Airsofting in your private backyard or other privately owned properties, be sure to notify any surrounding neighbors that they are Airsoft. Proper safety training, education and parenting is required prior to lending your Airsoft product to a minor. You acknowledge and understand the inherent dangers involved when operating Airsoft products and related accessories. Goggles and other protective gear should always be worn to prevent injury. Lithium batteries (LiPo) and compressed gas can be unstable if not used and stored properly. This may lead to fire, serious injuries, or even death. Please read warnings carefully before using. Express orders (UPS 3day, 2day and Next day) placed before 1:00PM PST are shipped the same day. If order is received after 1:00PM PST, it may not be shipped until the following business day. Domestic Grounds orders are shipped within 1~3 business days (not including weekends and holidays. International orders take 3-5 business days to ship due to extra compliance requirements. Order cannot be canceled or altered when it is in the shipping stage. Please call us right away. We will try our best to assist. In the event of a Back Order or Pre Order, your order may be fulfilled in two separate shipments. Shipment after the first will be shipped via regular ground service. All additional expenses will be covered by Evike.com. Your credit card is charged for the full order amount at the time of order placement. In the event of Back Order, you can request for an immediate refund. All repairs and upgrades completed by Evike.com carry a limited 45 day warranty. EXCEPTIONS: The warranty does not guarantee the operation of guns with a spring rating higher than M120 or equivalent, or any gun shooting over 400 FPS with a 0.20 gram BB. The warranty does not cover Lithium Polymer (Li-Poly) battery usage, or the usage of any other power source with an output greater than 9.6 volts, on an electric gun that is not rated for such use by its original manufacturer. The warranty does not cover any airsoft product, gun or otherwise, that uses higher pressured gas than liquid propane (Green Gas, 115 PSI). The usage of any BB less than 0.20 grams or of a lesser quality than Matrix brand, in any airsoft product, will void the Evike.com warranty. The warranty does not cover products that are not purchased from Evike.com. Once order is received, the order fulfillment process cannot be interrupted to make any changes such as add, change or cancel. You can submit a return after order is delivered. For purchases made at an Evike Outpost store, please contact your local store for a return, replacement or exchange. Warranty remains the same as online purchases. If you have any questions, please don't hesitate to contact us. Buyer assumes 100% ownership of products purchased from Evike.com and related websites. Buyer will hold Evike.com Inc., its staff, employees, and affiliates harmless of all liabilities and legal matters resulting from the purchase. Buyer agrees that all transactions done on online with Evike.com are sourced in California, where any future disputes will take place. Extended Holiday Warranty - Shop early with no worry and SAVE! We are offering extended 60 day warranty for all purchases made between Black Friday until end of the year. 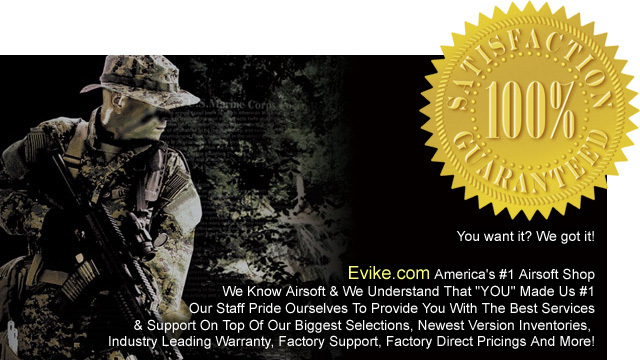 Another reason why shoppers pick Evike.com as their #1 Airsoft store. Happy Holidays! All products sold domestically on Evike.com carry a "45 Day warranty" from the date it is delivered unless otherwise specified. Warranty covers repair or replacement of defective or damaged product, as determined by the Evike.com service team. Non-warranty returns or exchanges may subject to a restocking fee. International warranty: Due to transit and cost limitations, international warranty covers replacement parts within 14 days of receipt, or 45 days if buyer agrees to be responsible for the shipping cost incurred. Transit damage: If you receive an item which appear to be damaged in transit, please keep the order intact and contact our Customer Service Team at [email protected] or call us at (626) 286-0360 to assist with a carrier claim. All returns require a RMA# before returned. Unauthorized returns will be discarded if unclaimed with 30 days. Please complete a return request on our RMA page. One of our service representatives will respond to better assist you or you can e-mail [email protected] directly for further assistance. Usage of low quality BBs will cause extensive damage to internal components and void warranty. We recommend using 0.20g BBs at a minimum. Warranty does not cover aftermarket internal parts once installed. Manufacturer defects must be documented prior to installation. Warranty does not cover damage as a result of defective parts. Epic Bonus Items offered with purchase must be returned. More info on the Epic Bonus program can be found on our Epic Bonus page. Low-value economical Airsoft guns under $60.00, shoes, and batteries are not covered under warranty. Hazardous Materials: Items classified as hazardous materials or use flammable liquids or gases cannot be returned. Warranty can be filed with their respective manufacturers. Items not purchased from Evike.com. If your package arrived damaged, please inspect and keep all contents and contact our support team immediately. We will assist you in completing a damage claim with the carrier. Want to learn more about you Airsoft gun and troubleshoot better yourself? Check out our YouTube videos online on basic AEG troubleshooting! If you don't feel comfortable, just send it back to us. All return packages will be inspected by authorized, industry leading technicians who will make the final decisions on the warranty claim. For any other returns or exchanges, please submit your request on our Returns page. Items must be unused, unworn, unopened, and in original packaging to be returned; a 15% restocking fee may apply to cover labor cost, product inspection, packaging, and handling. No restocking fee will be charged for returns resulting from errors by Evike.com. Shipping fees paid to third party carriers are non-refundable. Exchanges: You may exchange an item if it is unused, unworn and unopened within 45 days of delivery. Shipping cost will be deducted from the refund. Return for store credit: You may return an item for merchandise credit if the item is unused, unworn and unopened in its original packaging within 45 days of delivery. A 10% restocking fee will apply. Shipping cost will be deducted from refund. Non-Warranty / Repair / Upgrades Services: The labor rate for our technician is $40 a hour if you need assistance with any non-warranty repairs, upgrade service. All Evike.com technicians are in house and very experienced individuals. All returns will be inspected upon arrival to determine warranty coverage. Original shipping cost will NOT be refunded for non-warranty related requests; if a free shipping discount code was used, the actual shipping fee will be deducted from the refund. Evike.com coupon codes are randomly made available to provide our shoppers additional savings on either shipping charges or product price tag. There are NO rain-checks allowed on using a coupon code. Coupon codes does not apply to ON-SALE and MAP items and cannot be combined with any other ongoing specials or promotions. Certain items are excluded from %-off coupon codes. You can locate the exclusion list from our "COUPON CODES" page. A In the event of a return, the bonus item(s) must also be returned or the full retail value of the bonus item will be deducted from the store credit issued.